I received a large number of MIT cables to evaluate, including power cables, power conditioners, speaker cables, RCA and XLR interconnects, and digital cable. There is no way to do justice to this wide range of cables in a single review, so I decided to break this up into two separate but related reviews: first, MIT’s top-of-the-line digital cable and interconnects; second, speaker cables and power products. This is the first article, describing the effect of substituting MIT’s top-of-the-line digital cable and interconnects from my front-end through my amps. There will be no suspense in this review. The MIT Oracle MA-X is an absolutely fabulous analog interconnect and the Oracle MA-X Digital is an absolutely fabulous digital interconnect. It’s not that there might not be other interconnects that may work better in some other systems. Rather, it’s hard to imagine any other elite digital cables or interconnects being as compatible with as many high-end systems as Oracle MA-X. In case you have never encountered MIT, it stands for “Music Interface Technologies”. It has been one of the premier manufacturers of high-end cable during my lifetime. I don’t know whether anyone used them before MIT, but I have always thought of MIT as the originator of the use of a network box to maximize sound reproduction. The Oracle MA-X series now takes network box-based technology to a new level, and introduces a feature which made a big difference in my testing: according to MIT, the world’s first adjustable resolution interface. Among the cables I received were three Oracle MA-X Digital cables, two 1.5 meter pairs of the Oracle MA-X Proline balanced analog interconnect and two 1.5 meter pairs of the Oracle MA-X single-ended analog interconnect. Each analog interconnect sports a three-position impedance switch and a six-position rotary articulation knob. The proper impedance setting is determined by the input impedance of the component that is at the delivery end of the signal. The Oracle MA-X Digital cables each have a 6-position rotary articulation knob. I first ran an Oracle MA-X Digital from my Empirical Audio Pacecar (review to come) to the Lessloss DAC 2004 (review to come). I listened and took notes for three days before making any further changes. I followed up on this by inserting a balanced set of Oracle MA-X Proline interconnects from the Lessloss DAC 2004 to one of three preamps (Electrocompaniet EC4.8, MBL 6010D and Pass Labs XP-20), and a second balanced set from the preamp to my modded Lyngdorf RP-1 RoomPerfect Room Correction Device. After a week of listening in this mode, I substituted a pair of single-ended Oracle MA-X interconnects for the cables running between the DAC and preamp and used one set of the balanced Oracle MA-X Proline in a “creative” configuration with a Silent Source Music Reference running from the Lyngdorf to my amps (the 1.5 length of the Oracle MA-X Proline wasn’t long enough to reach my amps without “help”). I listened for two weeks in this configuration, after which I began removing the MIT cables one at a time, starting with the one between the Lyngdorf and the Electrocompaniet Nemo monoblock amplifiers and working my way back to the front-end so that the last cable removed was the Oracle MA-X digital. During this process I periodically substituted the three different preamps mentioned above. During this time I also used three different sets of speakers: my own B&W Nautilus 800Ds, the excellent Dynaudio Confidence C4 and the Bamberger Audio 5 TMW (review to come). The amps in all setups were the Nemos. As you can see, I tested these cables in a variety of setups, which enabled me to evaluate their flexibility – a key benefit of the articulation adjustment feature. I also used the two other Oracle MA-X Digital cables in my two secondary systems, which was in some ways as revealing a test as their use in my main system. My points of comparison for the Oracle MA-X Digital cable were the Transparent Reference and the Aural Symphonics Echelon Digital. Not to assign too much reading, but my review of the excellent Aural Symphonics Echelon Digital in the June, 2010 edition of Dagogo will help you get a perspective when reading my comments about the Oracle MA-X. My points of comparison for the Oracle MA-X interconnects were the Silent Source Silver Signature interconnects, Silent Source Music Reference interconnects and the Aural Symphonics Chrono interconnects. Again, for a reference point I suggest you read my review of the Chrono in the August, 2009 edition of Dagogo. (NOTE: The commentary in this section ignores for the moment the advantages provided by the Oracle MA-X articulation control.) I can spend a lot of time praising the virtues of the Oracle MA-X Digital cables and interconnects, but in this section I’m going to only touch on the four things in the caption of this section. I will discuss what really sets these top-end cables apart from the other über-cables I’ve heard in later sections. Rest assured that insofar as neutrality, extension, balance, dynamics and soundstage, these cables are among the best you can buy. Comparing first the Transparent Reference Digital and the Aural Symphonics Echelon Digital to the Oracle MA-X, all three cables were supremely balanced, but the Oracle MA-X Digital went just a bit deeper and had a more extended top-end. This characteristic was clearest when playing 24/96 tracks. For example, the track #15 on 2L the Nordic Sound, featured a Haydn string quartet that has extremely fast and details violin passages which sound their best when the nuances or the upper extremes are properly articulated. The detail is phenomenal in the 24/96 version of this piece, and the extremes become more discernible. Discernible extremes test the quality of a system’s extension at those extremes. With respect to soundstaging, all three cables were pretty equal, with very good width and depth. The Oracle MA-X seemed to provide a bit more depth and a tad less width. However, the performer placement of the Oracle MA-X was superior to both the Transparent and the Aural Symphonics. I assume this was in part due to the huge amount of detail imparted by the Oracle MA-X (see next section). The dynamics of all three digital cables were roughly equal both on a macro and micro level. This applied to every genre of music, whether it be Holst’s The Planets or Steve Vai’s Where the Wild Things Are. Quiet reticent passages were well articulated and loud explosive passages never lost their focus. These MIT interconnects are definitely superior to both the Silent Source Silver Signatures and the Aural Symphonics Chrono. Both the Signatures and the Chronos are exceptional cables which I selected because they were excellent matches in my regular system and how useful their differences are when reviewing components. However, the MIT Oracle MA-Xs were just a tad more extended at each end and cleaner in presentation. These characteristics created a more lifelike presentation. Comparing the Oracle MA-X Proline and single-ended interconnects to the Silent Source Music Reference was less dramatic. The Oracle MA-X’s soundstage was slightly different than that of the Music Reference: just a bit narrower, but also a bit deeper. This was evident on the 24/88.1 version of Who Do You Love? by George Thorogood and the Destroyers. With the Oracle MA-X the soundstage was deeper by what seemed like two feet, while also narrower by one foot. The Oracle’s performer placement was better, but not by much, while the Music Reference’s characteristic musical wholeness seemed stronger, but not by much. Extension and dynamics seemed to me to be a virtual tie on each piece I played. All of this should tell you that the Oracle MA-Xs are wonderful performers from the standpoint of extension, balance, dynamics and soundstaging. They are obviously top end cables without taking into account the impedance switch or articulation control. What do these features add? Substituting components proved to be a revelation. First, I used both the Pass Labs XP-20 preamp and the MBL 6010D preamp. The Electrocompaniet EC4.8 is closer to the MBL in its presentation, but between the MBL and Pass, so I’ve chosen the MBL and Pass as the companion preamps. Those of you who have heard these two components or read my reviews of them know that they are both detailed and dynamic, but that the XP-20 is neutral-to-lean, while the 6010D is weighty and bold. Later on, I substituted Dynaudio C4 for my own B&W 800D. The C4 was a bit “leaner and cleaner” in the bass, especially upper bass, than the 800D. 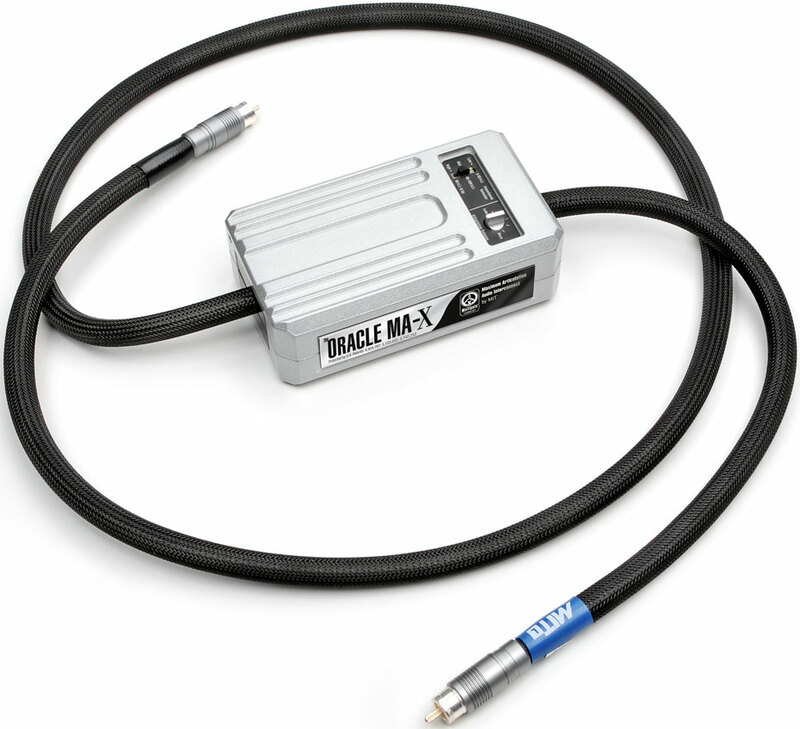 By using the articulation controls of the Oracle MA-X Digital and Oracle MA-X Proline single-ended interconnects, I could significantly adjust the presentation so that these components could be made to sound much closer to each other in presentation, but without any apparent loss of fidelity. I have no desire to make components sound alike. The point is that the ability to control the articulation level allows you to make fine adjustments that allow you to “dial in” your system in a way that I have never experienced. The synergy between system components, including cables, always determines the ultimate sound of a system. A hyper-detailed front-end with hyper-detailed amps and hyper-detailed speakers will tend to produce unnatural sound. We all mix and match components to achieve the musical presentation that sounds best to us in our own listening rooms. However, except for speakers with treble adjustments, we are normally forced to achieve that synergy by substituting components on an educated trial-and-error basis. This is not true when using the MIT Oracle MA-X cables. Having four simple dial-operated locations, on the cables between the transport and DAC, the DAC and preamp, the preamp and room correction and between room correction and amps, permitted me to adjust for the voicing of each component. This ability to make adjustments to the system’s articulation level allowed me to fine-tune the system sound by making small adjustment to different cables. If I had also received a set of the Oracle MA-X speaker cables I would have had a fifth point for making fine-tuning adjustments. In short, I’ve never had such flexibility from a set of cables. It was as though I had several different-sounding cables to choose from, but could test them against each other without disconnecting and reconnecting. Comparisons were effectively instantaneous, and tweaking to maximize system synergy was a snap. I should note that though the articulation adjustment switch was clearly the newest and most imaginative new feature of the cables, the impedance-setting switch was also quite instructive. MIT’s manual makes it clear that you need to first set the appropriate impedance level and only afterwards beginning the process of adjusting the articulation settings. However, I had originally set the impedance settings from memory, and it later turned out that I had gotten it wrong on two components and had to reset the two cables connected to those components. I expected to hear subtle improvements when I made the corrections, but was surprised by a much greater sense of clarity and presence. It is clearly essential to follow the installation instructions on these cables to get the best sound. When you pay this kind of money for this type of quality you should take the time to do it right – you will be rewarded. I like detail, but I’m not as enamored with it as some. I’ve rejected several products that produced too many details. How can a system present “too many” details? I admit it’s my prejudice, but if it doesn’t sound natural – e.g., you hear details that can rarely be discerned even in a quiet studio setting – then that’s too many for me. However, once properly installed and dialed-in, the Oracle MA-X were the most detailed digital cables and interconnects I’ve ever heard, and I absolutely loved them. Why? I concluded that most of it has to do with the ability to adjust articulation to get the maximum amount of detail possible while still keeping the appropriate level of body and weight. However, some of it also has to do with the absolute elimination of any glare and any other artifacts that arise from the cables themselves. I previously thought that my system had long ago eliminated these things, but the Oracle MA-X showed me that more is possible. Even when set to the highest articulation setting, the cables consistently presented a very clean top-end without any “electronic” feel. In my book, this is quite an accomplishment. The only other analog cables that sounded close were the Silent Source Music Reference, but they don’t quite have the level of detail imparted by the Oracle MA-X once they are set up. After I had determined my favorite settings I concluded that I needed to test them with other listeners’ ears. Several listening sessions with guests seemed to confirm my opinion, but I had a golden opportunity to get an opinion from an acquaintance who works for Shure (microphones) and has extensive experience in setting up live concert systems. One Friday evening he was one of several guests that listened to familiar music while I made changes to the settings on the MA-X Digital cable and the three analog interconnects in my system. I started by setting the articulation settings one notch higher than what I had concluded to be ideal. I then adjusted the setting one cable at a time, starting from the amps and working back to the source one set of cables at a time. The effect of each individual adjustment was modest, and in each case we were able to perform a “better one/better two” evaluation, just like getting new glasses at the optometrist, until we actually reach a complete group consensus of the “best” sound. The whole process took approximately 50 minutes working with four sets of cables. It would have taken hours to accomplish the same thing with other cables, and the time between cable changes would have left doubt in our minds about whether we had actually achieved the best balance. To be sure, the network boxes on MIT’s cables can pose some challenges where the height of your speaker’s connections exceeds the length of the cable after the network box. You need to properly secure the network boxes so as not to damage the cable. I was able to address this issue without much problem, but then I have various supports from my past experience with using Z-Sleeves on speaker cables. MIT provides velcro straps to help you deal with this if it applies to your setup. These are absolutely fantastic cables for the serious audiophile. They would be phenomenal cables without them, but I cannot overemphasize the contribution played by the impedance-matching and articulation adjustment controls. The ability to rapidly get to your preferred musical presentation without trying dozens of cable combinations is a major advantage of Oracle MA-X cables. If you have the money and want a straight beeline to the best sound from your combination of components, these cables will get you there fast. Moreover, you’ll also be able to change out and audition other components without wondering whether they might have sounded better with other cables. The price of such convenience is obviously high, but it’s hard to imagine that you would ever have a need to replace your cable again. So, you can say all you want about insane audio pricing and the high-end market, as well as continue your search for the $1,000 pair of cables that sound as good as an $8,500 pair of cables, but the truth is that the MIT Oracle MA-X series of digital cables and interconnects is phenomenal. Very expensive, but very highly recommended. Hi, I purchased the mit oracle max digital ic after reading your review. However I find the cable to be relatively bloated and it’s presenting with a slightly muddy top end. In comparison my kimber D60 is clean as a bell. Have you noticed this with the mit in certain setups? I’m using an esoteric transport and an Accuphase dac card with the focal electra be speakers. To Dagogo’s readers: We have contacted the customer and he is sending the cable to MIT Cables for repair. While this is a repair issue, we find that issues like these usually tend to be settings, or lower than normal voltage output if the rise time and decay time sounds like “bloat”. Thanks to MIT for fixing the cable.apparently they identified it as a flaw and asked me to send them the cable back for inspection. They found out that there was an issue with the cable and returned it to me after addressing the problem. The cable definitely has cleaned up. It sounds fantastic bit make sure that you use good recordings. It had a superb mid range and is very very holographic on well recorded CDs. Hi there, I’ve got a pair of MA-X XLR lately, and find that there are some problems: After setting the impedances to “9k and over”, the images are so precise, with proper size and placements, and the soundstages are so vast and deep, however, it’s very apparent that the high frequency rolled off very quickly, the mid bass become muddled and rolled off, volume of bass becomes much smaller, and the voice of vocals, while still have solid image and size, it feels like there is a very thick curtain hanging between me and the singers. I’m very surprised because MIT cables have long been praised as perfect matches with Spectral Pre/Power Amp combinations. In fact, I’ve tried the other impedance settings, but anything below “9k and over” happened to break down the images and don’t help the issue with bass. I’m wondering what May have caused that? Previously i have Analysis Plus Silver Oval, which don’t produ, provided with the prices, I suppose the MA-A should offer major upgrade on every aspect. Hello Kenny: There can be many reasons for conflicting results vs expectations; Break in, wrong settings or even powerline problems, just to name a few. Please contact your dealer or send your info to info@mitcables.com and an engineer will contact you to resolve your problem. Firstly , if you got the link to your review of Oracle MA-X Digital , Transparent Reference and the Aural Symphonics Echelon Digital would be great. I got the MIT Oracle MA-X Digital cabel between my dCS Puccini SACD / DAC ( + Puccini Word.clock) and my dCS Network Bridge streamer , and i have set the articulation knob on the middle setting att 12 O’clock , but would like to know what setting you ended up with as the perfect match in your setup and how you find the diffrent settings on the knob did differ from the lesser setting to the max setting from your experience?